We dismiss Evgeniy's wise warning about traffic, and our own rule about not rushing, and leave Moscow at precisely the wrong time. We've stayed in the city until five o'clock, and are now running around to drop off Evgeniy's key, buy groceries, and hit the road. 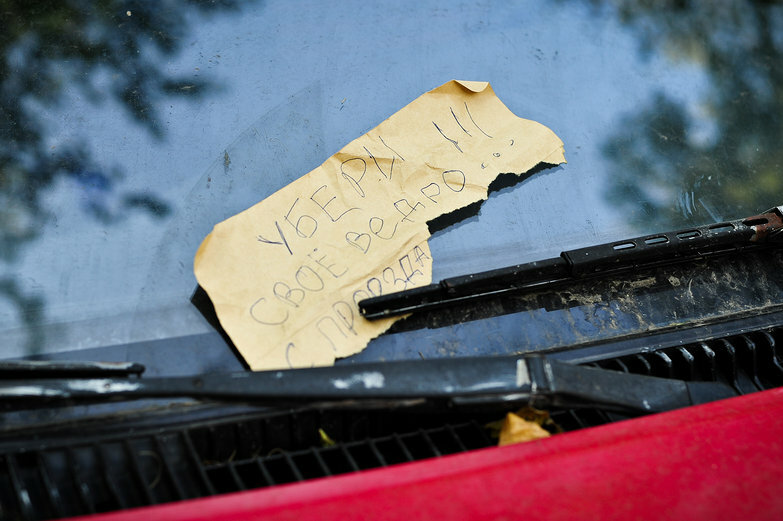 Leaving Elizabeth's apartment, we find this friendly note affixed to our car. It translates roughly as "TAKE AWAY FAILURE BUCKET!!!" Ha! In retrospect, we should have asked to impose upon either of our hosts for one more night, but we were both eager to get out of the hot smoky city, and into the countryside. And so, we, along with half of Moscow, take to the highway. In a jumble of metal and exhaust, we creep, feet at a time, towards the MKAD. As if the snail's pace of traffic isn't bad enough, there's the unbearable heat and the hazy searing smoke to make the situation worse. Drivers are impatient, cutting one another off, making room for themselves to merge where there is none. The resulting accidents cause even more jams and blockages as police and tow trucks try to maneuver themselves through the fray. I cannot imagine driving this commute every day! If it wouldn't take an hour or two to turn around, driving right back through our patiently earned five kilometers, we would. But, we've come too far. We inch along in silence. At last, we are out of the city. Suburbs diminish, and soon we are in the proper countryside. We're driving along rows of intricately carved Russian houses when we pass… wait, is that a camel? 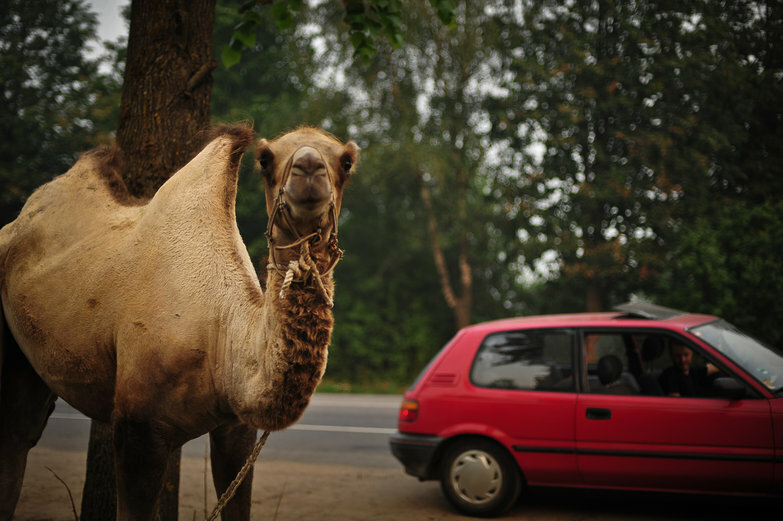 A camel is tied to a rope by the side of the road! I have no idea why. Tyler stops and turns us around to investigate. I get out to take pictures. It is sort of cool but I also don't trust it, and I don't like it when it it comes towards me. I have ridden a camel, yes, but it was very tame, with a guide. I have no idea what this guy will do! Backing away, I walk towards one of many roadside stands we've passed, in hopes that they'll have jars of pickles or apples or pastries or something. When I arrive, a very nice woman is hovering around her little wooden table. She has a pumpkin and two rotten-looking eggs and some potatoes. We get to talking, but of course we can't understand each other so I say my "ya nyegavaru pa ruski" and she smiles. It occurs to me that she seems much more smiley than the people in Moscow, and I'm glad we're heading into the countryside. Then, since she's so nice, I decide I should buy something from her. It would be weird to just walk away now, or to go to her neighbor's table. I decide I'll pick up a few potatoes. We don't have a lot of food, and I figure we could use some staples. I ask "skolka stoyit" which means how much is it? And she responds and of course I can't understand, so she holds up her hands. As I'm busy counting how many gnarled fingers she's presenting, she takes my silence as a bargaining tactic. She drops the price, lowering one of her fingers. I don't know if this is the price per kilo, or potato, or if her 7 is actually 70. I reason that it's probably 70 rubles since 7 rubles equals approximately nothing. I start handing her bills, first a fifty and then a ten. Then all I have are coins so I give her a five and then two 2s, and she smiles, saying that that will do and not to worry about the last ruble. "Na zdarovya!" she says, "na zdarovya! ", nodding and smiling. I have no idea what I just purchased. Then, she takes the entire bucket of potatoes and dumps it into a pink plastic bag, which she hands me proudly. There are enough potatoes to last us for a month. I smile and thank her, and ask to take her picture and she gets all shy and says "nyet nyet nyet" as she's giggling, embarrassed about her blue flowered house dress. I smile and say okay, and we part ways. 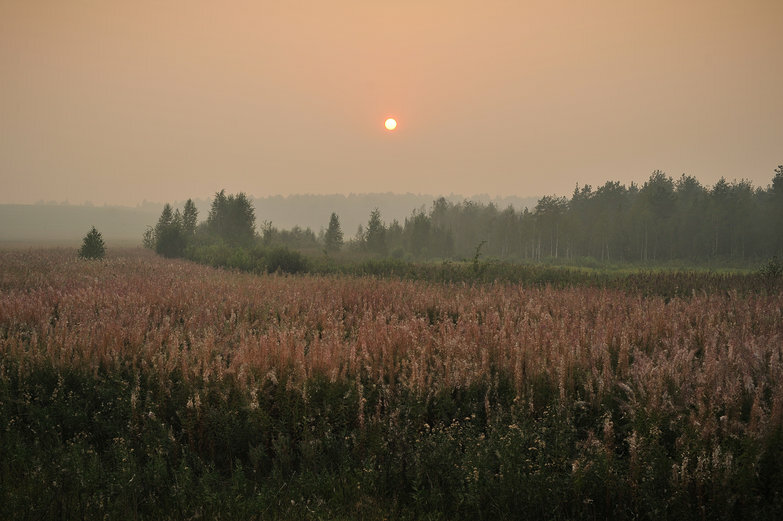 The light is strangely pink from the smoke that obscures everything (Western Russia is the middle of record setting heatwave and widespread forest fires), and the plastic bag of potatoes is digging into the palm of my hand. Up ahead, through the haze, Tyler is sitting in our LRC and a camel is gallumphing around on his rope before it stops, lifts its tail, and begins to poop brown marbles. I've returned with neither the pickles, nor the apples I had hoped for, but a month's worth of potatoes. Oh well. "What's with the potatoes?" Tyler asks, laughing. I shake my head a little and chuckle. I have no answer. We drive onwards, thinking maybe we'll spend the night in a motel, as already we are covered in sweat and road grime and would love a shower. We are appalled to learn that a night in a regular establishment will cost us at least 2,000 rubles (about $60). So much for showers. We follow signs to one more hotel, cautiously hopeful, but we wind up on a crazy potholed dirt road that dead-ends into a bunch of houses. By now it is nearing darkness, and the world takes on that exciting and sinister feeling Tyler sensed a few days ago. Russia is strange at night! A few kilometers from Pereslavl-Zalesskiy, our first Golden Ring stop, we find a nice field free-camp, and make ourselves at home. 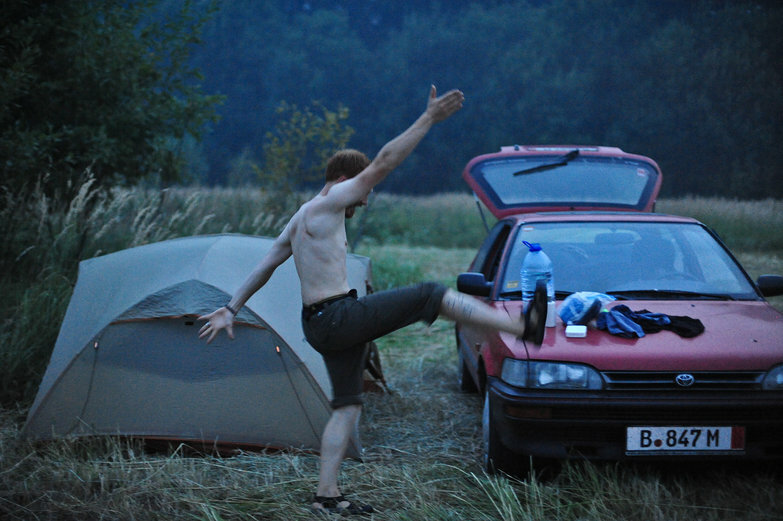 The mosquitoes are pretty bad tonight, so Tyler does a dance to keep them at bay as he goes about his business. We've run out of soap, so he uses shampoo in his hair as a loofah, building up a good lather. With the foam, he cleans his armpits and chest and face, all while dancing and marching and swatting the bugs away. I douse his head with water from our giant jug, and he rinses himself clean. This life of ours is so bizarre sometimes. "But, we've come too far." Kumar: I forgot my cell phone. Harold: You wanna run back and get it? Kumar: No, we've gone too far. Tara and Tyler go to White Castle?? We parked in the middle of a long line of cars. It was a narrow street though. By the time we left, our car was one of the last ones out there though. Maybe we got the note and others didn't because our LRC is so crappy looking!